If you thought you knew and loved kale (and I’m being brave here to assume that you love kale), you will rethink your relationship with it having tasted this kale salad I have prepared for you! It is so addictive, I’m afraid you’ll overeat! Now, if you don’t love kale, or never tried to love kale, this is your chance! I guarantee that things will change and kale and you will become besties once you’ve tasted my salad. 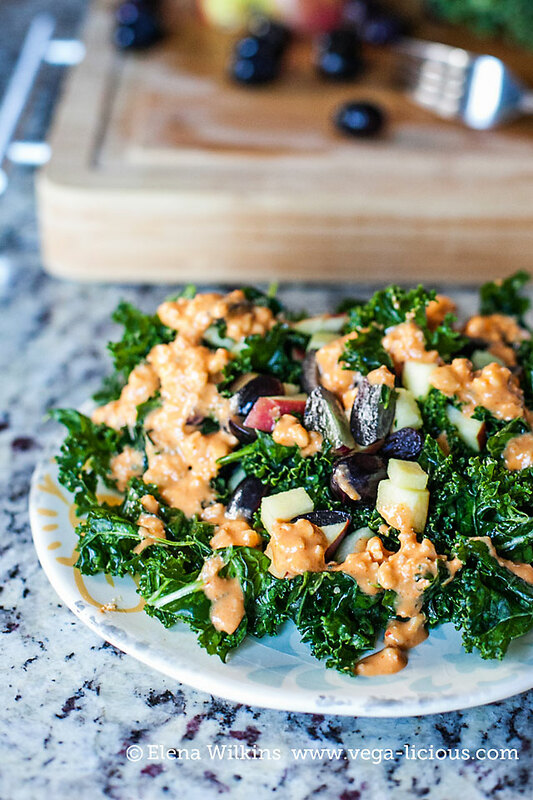 This is the BEST kale salad you’ll ever have! How can I possibly know that what I’m telling you is true? 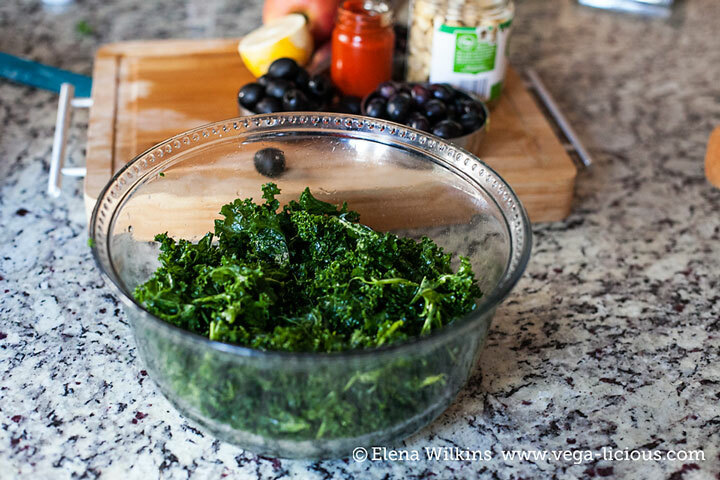 I’ve been munching on kale, as a part of my full-time vegan diet, for over nine years now. I’ve tried kale about any which way you can imagine–straight up, in smoothies, juices, soups, stir frys, and salads. 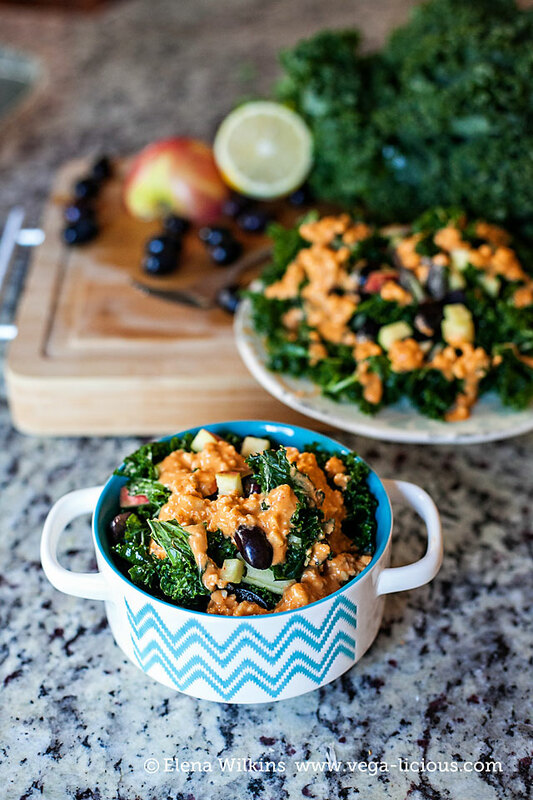 While kale is a very versatile plant, and it certainly became quite famous in the last few years; however, when it comes to kale salads–not all of them are created equal. I tried enough of them to know. 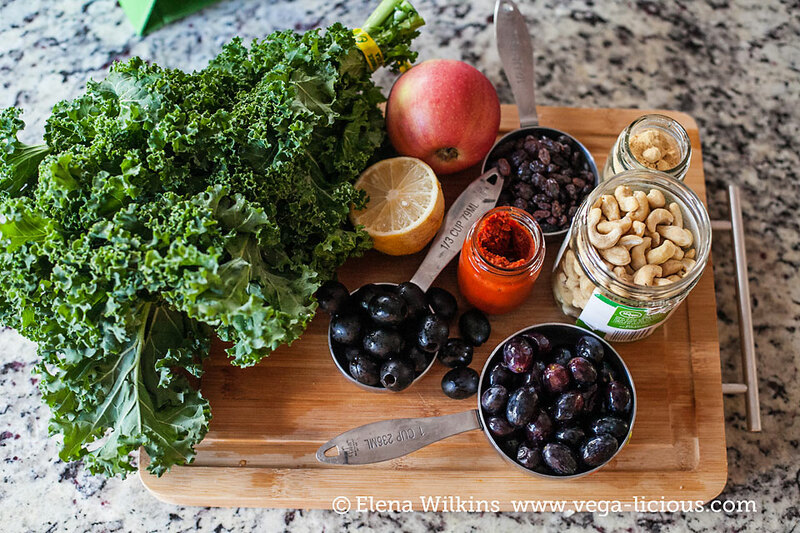 One day, tinkering in the kitchen, I thought: “What would happen if I throw a bunch of ingredients in a blender, chop kale, and massage it…not so very gently?” The rest, as it’s often said, is history. This salad became an instant hit with mua, then with my kid and my Hubby, then with my clients, and even with friends and family. 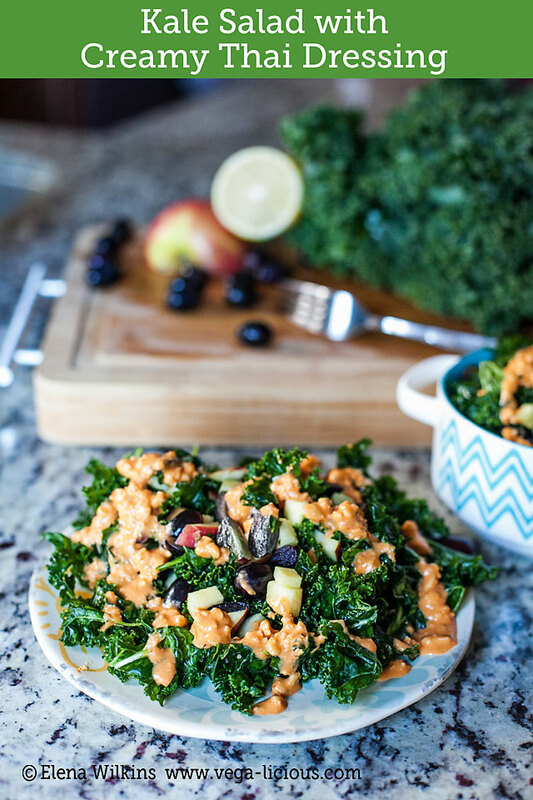 Tried and tested too many times to count, but enough times to know that this will be the best kale salad you’ve ever had, and probably the last you’ll ever want to try. Most of the ingredients are easy to find. The one you might not readily have in your pantry is red curry thai paste, but you can easily find it in most supermarkets. My favorite is by Thai Kitchen–it has just the right amount of heat, without being overpowering. 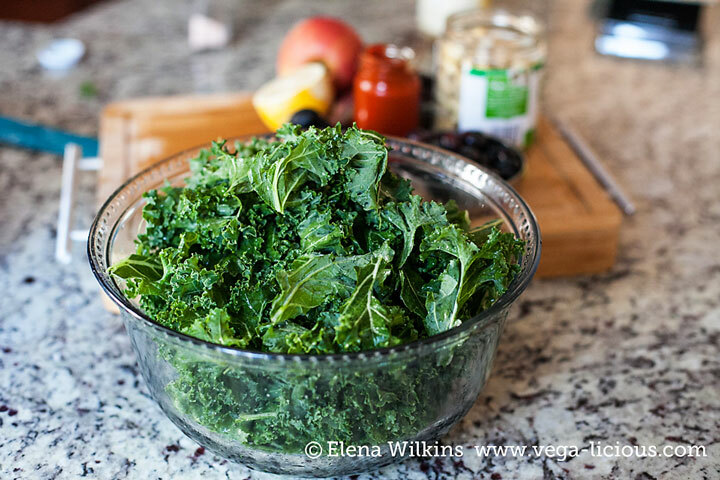 The magic key to a perfect kale salad is how smooth you can get with your kale. (Que early jazz music playing as you are romancing your kale in the kitchen…) Sorry…I got carried away. The key to a perfect kale salad is softening kale leaves by massaging them. When they wilt a little, they become amazingly tasty. The second key is to not mess with my Creamy Thai Dressing recipe. Trust me on it–you don’t want to mess with perfection! 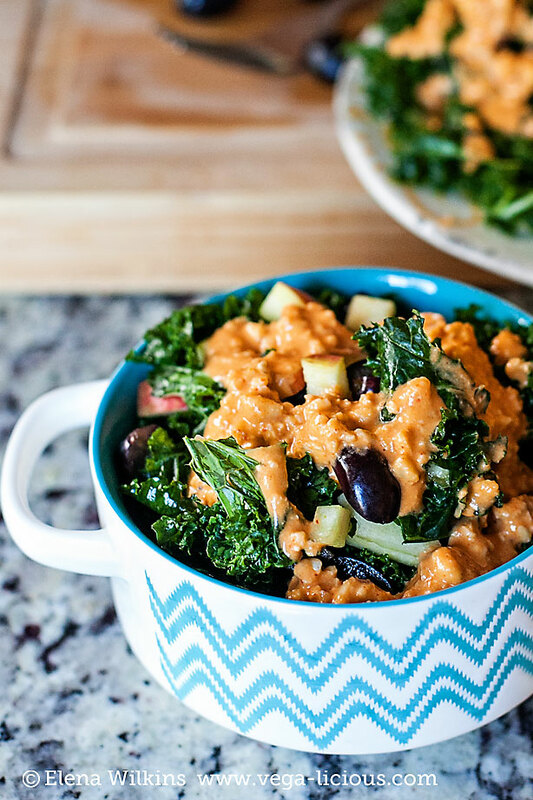 While most salads are considered side dishes, in case of my Kale Salad, smothered in Creamy Thai Dressing, you’ll forget about everything else and make it your side dish, main dish, and even your dessert. I promise I am not exaggerating. If you thought you knew and loved kale, you will rethink your relationship with it having tasted this kale salad. It is so addictive, I'm afraid you'll overeat. pour over salad, toss and enjoy! M-A-K-E it! I dare you! Because it will make you swoon as if your taste buds just went out on their first date with the love of their life. Once you make it, don’t forget to let me know what happens–fireworks, explosions, spontaneous combustion… One thing I know for sure–you’ll never look at kale the same way again!